For thousands of years jewellery has been used as a protector - a talisman, worn to protect the wearer in times of trouble. When I was asked to create a piece of jewellery to be worn in the field of combat I was both honoured and thrilled. 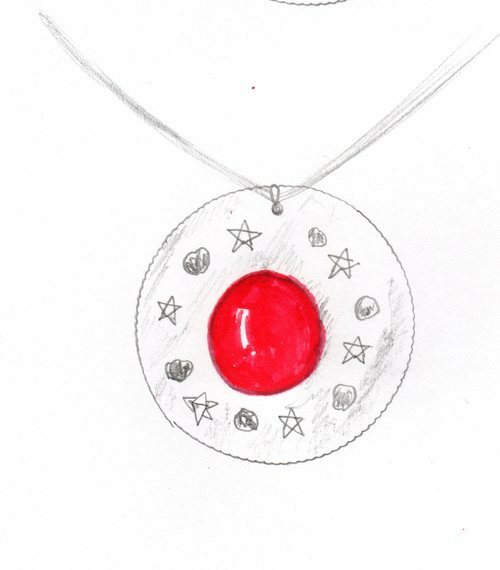 For security reasons I cannot give the name or location of the owner of the necklace, but when he asked me to create something he could wear in the warzone he was about to be sent to. I gave the commission a lot of thought, and as I knew he wanted it to contain a piece of meteorite I thought it would be appropriate to use Mars as a symbol. Mars is known as the bringer of war and has long been associated with death and bloodshed. More than 3000 years the Sumerian civilisation were thought to have started this link - and this has carried on by their successors the Chaldeans who adopted Mars as the bringer of War and christened it Nergal. This tradition carried on through the Greeks and on to the Romans, and even today the symbol of Mars is a shield and a spear. 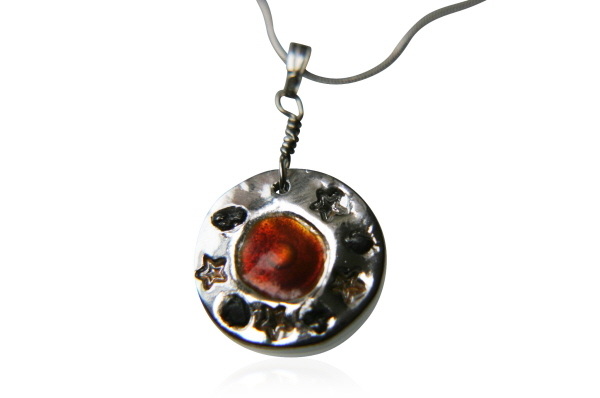 I set a disc of red glass enamel in the centre of the pendant and then surrounded this with star symbols and fragments of iron meteorite.I felt that using a meteorite in the piece gives it a sense of timeless power and eternity. When the pendant was finished, I boxed it up and posted it off to the recipient. he picked it up as just as he reached the field of combat, and I received a lovely email from him shortly after. Wearing Mars - Bringer of War every day. Attaching a pic taken yesterday after patroling a village. Really hot and dusty. All the commissions I make are special to me, but this has to be the MOST special. 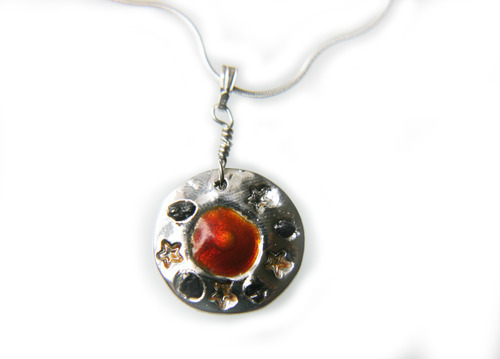 I think it will stay with me for a long time that I have created a piece of jewellery that has such resonance and power.